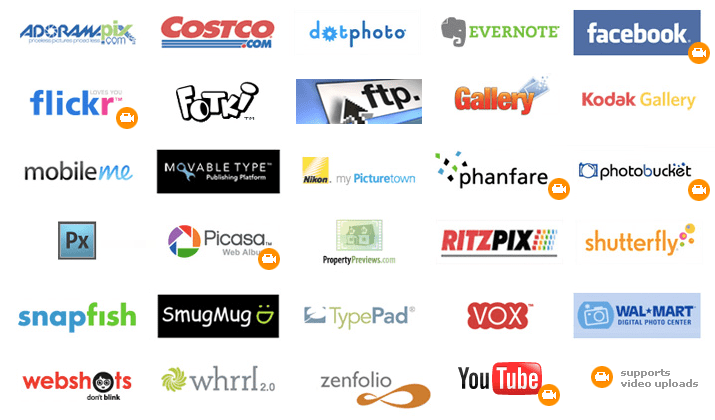 Eye-Fi has been around for a few years now. These great little SD memory cards can connect to WiFi networks while in your camera, and upload your photos automatically to your computer or up to 25 other online services. Google Picasa has also been around for a while, and someone over at Google came up with the idea that it would be great to pair the two together. Now for a limited time, Google is giving out a free 4 GB SDHC memory card with every purchase of a 200 GB storage upgrade for Google Web Picasa and Gmail. check this camera compatibility list. Usually, if your camera is less than three years old, it WILL be able to support SDHC cards. Do keep in mind that SDHC cards are a lot faster than regular SD cards. Once you have your Eye-Fi card plugged into your camera, you can directly upload photos to Picasa, Facebook, Flickr, and many other online storage accounts. The only requirement is that you have a WiFi Internet connection. And yes, a home wireless router will work just fine. The best feature about this card is that if it’s connected to the Internet, it can automatically backup all of it’s stored pictures to your computer or even an FTP site you configure. The free card is great, so what’s the deal with Google storage? 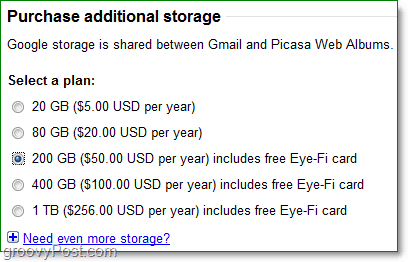 The storage service from Google will give you the amount of space you pay for in both Picasa and Gmail; the two services share this space. The minimum amount of space you have to buy to qualify for the card is 200 GB, which will cost you $50.00 USD per year. If you were interested in buying an Eye-Fi card regardless, think of this as getting it for free and saving $19 on the card. The Google storage service will automatically renew annually, but there isn’t an obligation to do so. There isn’t any real downside to this deal. The service is excellent and reliable. 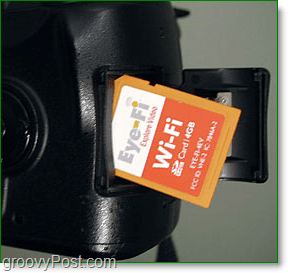 Eye-Fi cards are very groovy and help you save time. Shipping takes 2-4 weeks for the card, but shipping is free too. Eye-Fi Service charges dismissed with this card/deal. If you have any questions or comments or a groovyDeal? We’d love to hear about them in the comments or our groovyPost community forum! I've been waiting for the Eye-Fi service to go 802.11N however about 2 months ago I broke down and bought a card. free unlessn of course you upgrade storage. For simple photo sharing it's a nice option.